Nos 1 and 2 Fairfold's Farm cottages, Sandridge were built as a timber framed farmhouse in the 15th or 16th century with cross wings probably added in the 17th century. This was later turned into two two cottages. It has gabled wings at each end, slightly projecting and with steep pitched roofs. Centre right section was probably an open hall when first built. In 1589 it was known as Feyrwnlfes in the will of Robert Thrale1. 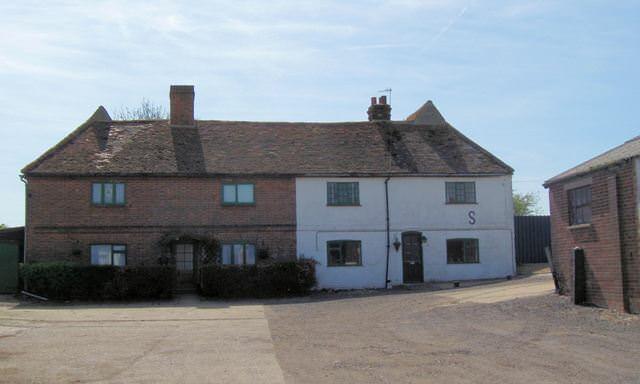 In 1726 Fearfull's Farm was part of the Manor of Sandridge. The copyhold owner was John Huntsman and the tenant was Joseph Smith. The farm was a big one for the time at 229 acres. Members of the Thrale family were farmers there in the second half of the 18th century until the death of Thomas Thrale in 1813. Thomas was succeeded by his brother-in-law Charles Parsons, who was there until 1834. The next farmer recorded there was James Cole. Later in the 19th century members of the George Family also farmed there as did George Byles. 1. Arch. St Albans Reg. Ewer fol. 27 (Richard Thrale d 1541) and Reg. Clapton fo. 132 (William Thrale d. 1589. All Fairfolds farm genealogical records.